Home / Entertainment / Marvel Reveals Official 'Captain Marvel' Poster! Marvel Reveals Official 'Captain Marvel' Poster! 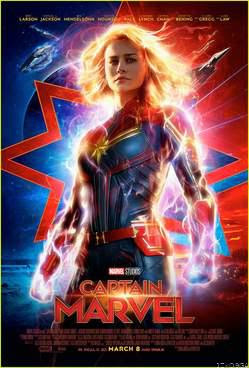 The poster for Captain Marvel has arrived! Marvel Studios announced on Sunday (December 2) that the official trailer for the upcoming movie will debut on ESPN’s Monday Night Football during halftime of the NFL game between the Washington Redskins and Philadelphia Eagles at Lincoln FInancial Field on Monday (December 3). Ahead of the trailer’s premiere, the studio revealed the official poster for the movie, which opens on March 8, 2019. Captain Marvel follows the journey of Carol Danvers as she becomes one of the universe’s most powerful heroes. While a galactic war between two alien races reaches Earth, Danvers finds herself and a small cadre of allies at the center of the maelstrom.